Rangetops all look the same. They are basically tops to pro ranges. There are a few better performers in the sea of similar looking products. Thermador and Miele would be in that category. They may look similar, but these two are better at different types of cooking. So, you would choose either depending on what you use the unit for. We will look at both companies, both units then compare. Thermador was founded in 1916, by William E Cranston where he began the company manufacturing electrical products. To date, Thermador is the third largest appliance manufacturer in the world as part of the German BSH Home Appliances Corporation. Thermador also introduced America to many of the industry’s firsts like wall ovens, downdrafts and cook tops to name a few. 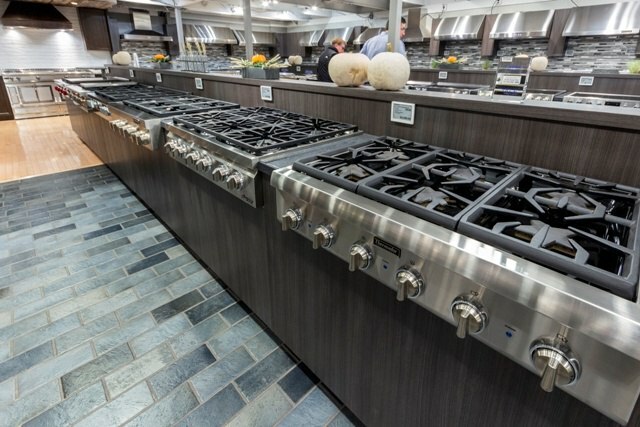 They were the first American premium appliance manufacturer. They are also known for their aggressive 1, 2 free promotions with free dishwashers and hoods based on qualifying purchases. 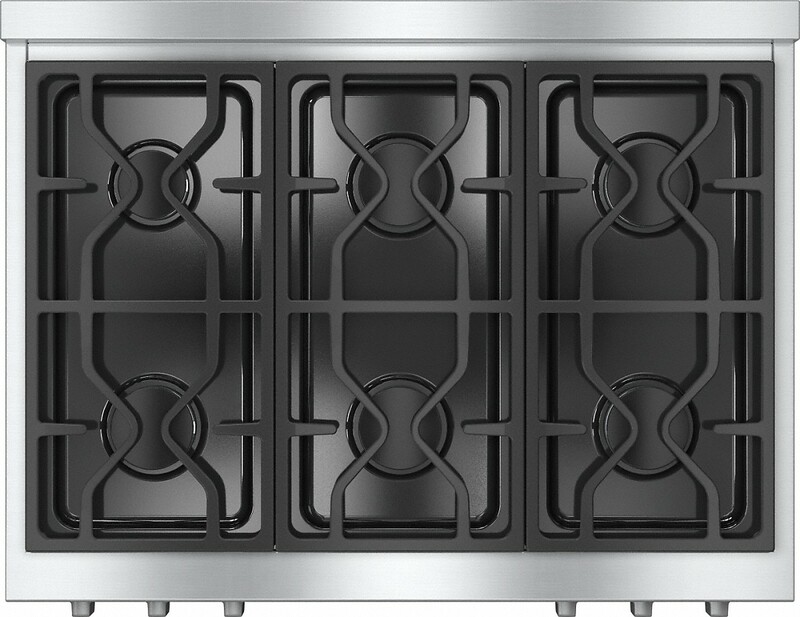 Thermador products are made in the U.S.
Patented 5 star burner - Better distributes heat to the base of the pans. Easy clean base - Low profile dividers make cleanup a breeze. 2 Extra low simmers - Precision simmering allows burners to go as low as 100°F! All 6 burners are 18,000 BTU’s. Does have a grill and griddle option as well. “Forever Better” is the Miele motto. A family-run company that has stayed that way since its start, the company was founded in 1899 by Carl Miele and Reinhard Zinkann. Miele is brand new to professional American style cooking. They are different, because they manufacture down to the component level rather than outsourcing like most.  This typically creates a more reliable, yet more expensive product. All Miele products are manufactured in Germany. There heavy duty knobs are backlit- Makes them easy to find. So we are comparing two different German companies. The units are different as well. Miele is technically more powerful by 1,000 BTU, but the Thermador Star Burner is more cleanable. The unit is raised, so you can clean underneath. Miele is sealed but harder to clean. Thermador is also the best simmer on any gas burner. It turns on and off to keep a mean temperature of 100 BTU. Miele excels in the grill/griddle models. The grill is infrared, so it can sear very well for an inside unit. Infrared also evaporates drippings for clean ability. Only Wolf has infrared in a range top. The griddle is gas as well. Both respond better than the Thermador electric grill and griddle. Thermador is $600 cheaper. Buy a wall oven and receive a free dishwasher as well, so the price could be $3,500 or more with the three units. Both are great units. Although most people buy all burners, griddles can cook almost anything. But that is the real difference. If you cook with burners, buy a Thermador. If not consider a Miele. Looking for up to date information on professional ranges? Get the Yale Pro Cooking Buying Guide with specs, BTU outputs on all the models and detailed profiles of all the brands. Well over 195,000 people have read a Yale Guide.